tap into a little more of that success, he approached magazine illustrator Raeburn van Buren about the possibility of starting a new strip, written by Capp and drawn by van Buren. Van Buren turned him down. He was doing just fine illustrating stories for The Saturday Evening Post, Collier's, Esquire, etc., and at age 46, saw no reason to embark on a new career. But Capp persevered, citing a diminishing audience for story illustration, what with radio eating into the reading audience by providing stories for free. Van Buren eventually relented, won over by the desirability of a regular feature over the uncertainties of the freelance life. Abbie & Slats began on Monday, July 12, 1937, distributed by United Feature Syndicate (which was already handling Abner, as well as The Captain & the Kids, Fritzi Ritz and other top comics). Capp opened the strip with a sort of reverse on his Li'l Abner scenario. There, the protagonist was a rural innocent, and the first storyline sent him to New York. Abbie & Slats started with street-wise Aubrey Eustace "Slats" Scrapple, recently orphaned in New York, arriving by train in a small town called Crabtree Corners. He was met by his older cousin, Abigail Scrapple, a hatchet-faced spinster who initially looked askance at the thought of raising any kid with a name like "Aubrey Eustace", but quickly took a liking to tough, headstrong Slats. Abbie's sister, Sally, more prim and proper than the other two put together, rounded out the household. 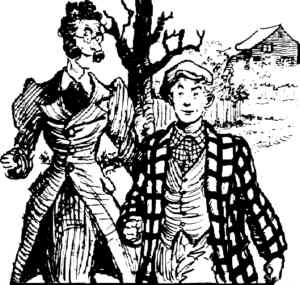 Other early supporting characters included Jasper Hagstone, the town skinflint, who became Slats's sworn enemy when Slats slammed into Hagstone's limousine to avoid running over a dog that couldn't have been worth more than two bucks; Hagstone's daughter, Judy, an early object of Slats's affection; and Becky Groggins, who became Slats's one true love. Becky's father, J. Pierpont "Bathless" Groggins, also introduced in the strip's early days, was more than just a supporting character — over the years, he became a very prominent character indeed, and was pretty much the star of the Sunday strip. Despite his initial reluctance, it was Raeburn van Buren whose name is most associated with Abbie & Slats, even tho the early strip was packed with Capp's unmistakable style of extreme character interactions. (And who else would name a character "Bathless Groggins"?) It was also van Buren who made a career of it, as Capp left the strip in 1945. His brother, Elliot Caplin, whose extensive writing credits include but are far from limited to Big Ben Bolt, Encyclopedia Brown and The Heart of Juliet Jones, took over the scripting. Capp later made a second stab at writing a strip for another artist to draw, Long Sam, but mostly stuck with Abner. Abbie & Slats was a successful strip for years, but not one of the superstars. It was occasionally reprinted in the back pages of Tip Top Comics, like Ferd'nand, Gordo and other United Feature strips, but that was its only excursion off the newspaper page. In 1971, 80 years of age, van Buren retired, and Abbie & Slats passed into history. Text ©2002-07 Donald D. Markstein. Art © United Feature Syndicate.